Today I thought I’d bless you all by sharing my another Kadii Creation. I’ve recently gotten into quilting, hand sewn quilting. It’s my new therapy. Honestly, at the end of a long day I just lay back in bed with my needle and thread and just go to work. And my mind is clear… At that point I focus on nothing but what’s in my hands. All of my worries, issues, and thoughts go away and I just sew. Now, this was not my first quilt, but it’s my first hand made quilt. The first quilt I made was a t-shirt quilt, made in two days that stressed me completely out. That process was not therapy but I found a way to calm the storm. My co-worker/ friend is expecting a baby girl soon. 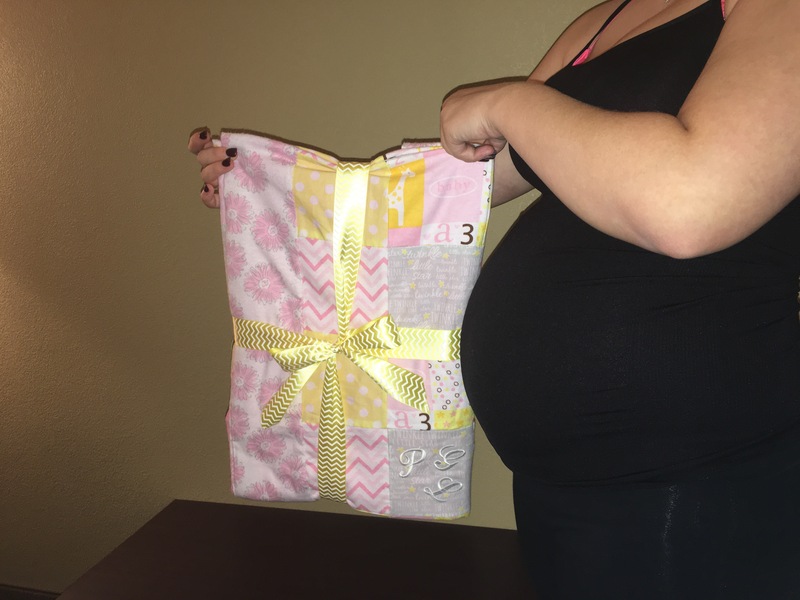 So I made this baby quilt for her. It took me about three months but it brought me peace. If you’re interested in quilting, I’ll share with you how I did this. To start, I took a trip to the fabric store. Mother to be wanted a pink and yellow theme for the baby room. 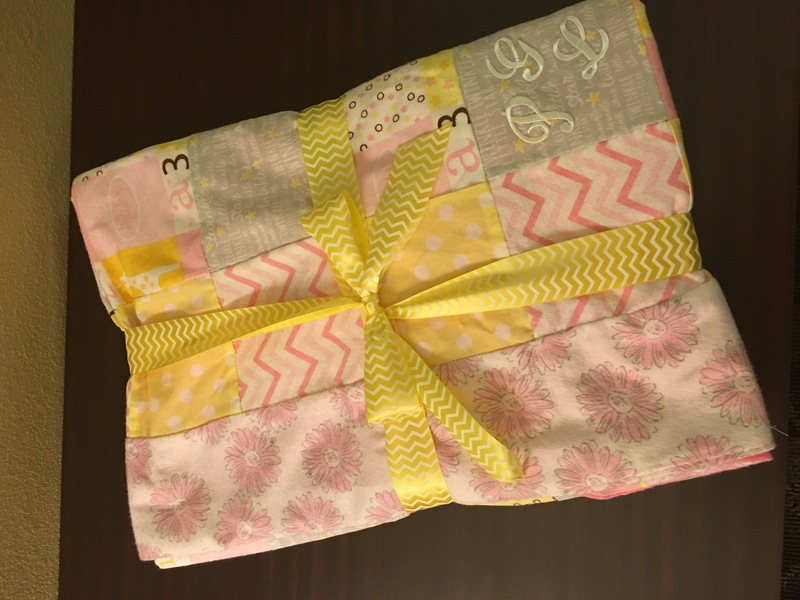 So I found the fabric patterns found in the quilt: light/dark pink chevron pattern, twinkle twinkle little star (gray), yellow and white pot a dots pattern, and a mix baby pattern. 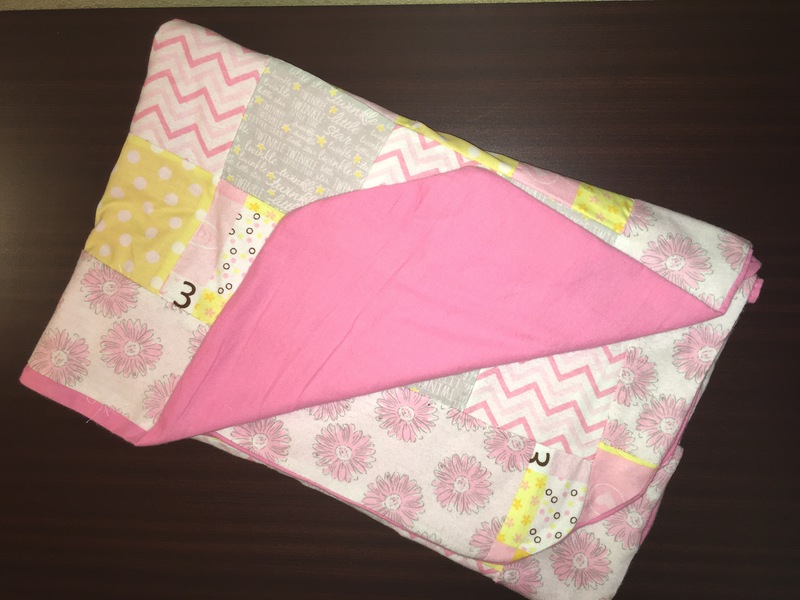 A flower pattern was used for the boarder of the quilt and a plain pink fabric for the backings of the quilt. I didn’t know how much I would need, so I just got 2 yards of each. I purchased everything from Joann’s fabrics so there were some discounts involved. I used a 6 inch square quilting stencil to cut out my squares. For this size quilt I 20 quarts for each pattern and a 5 inch boarder all around. 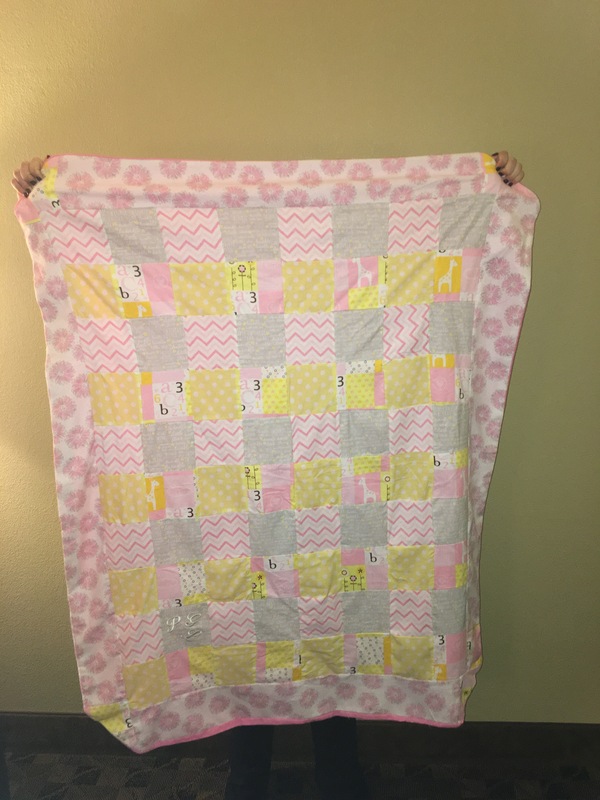 First I cut all of my fabric squares, for this baby quilt. I used 20 6 inch squares to make 20 pattern squares of all four fabric designs. After cutting, I began to see all four squares together to make my quilt pattern. When that process was done, I laid out the patterns to arrange them the way I wanted gombe quilt to look. With 20 patterns, I was able to compose 4 patterns across and 5 patterns down. Next, I pieced I’ll the patterned together and ironed the quilt flat. Then I was able to measure the quilt to add my trimming. I used a pink fabric with flowers as the boarder on all four sides of the quilt. After this was complete I again ironed the quilt flat. With my solid pink fabric, I began to pin the quilt and the backing together to prepare for finishing the quilt. I was so happy with the finished product and can’t wait to start my next quilting project.